Batman #63 is out 1/23/2019. By Zack Quaintance — There’s a very familiar feeling to the start of Tom King’s Batman #63. Mikel Janin, King’s primary collaborator from July’s infamous Batman #50 Bat-Cat wedding issue, is back providing the artwork. Moreover, what’s actually happening on the page is familiar too. Bruce is on a rooftop in a tuxedo as the sun comes up, just as he was during the wedding, flanked by Alfred and a tipsy officiant. There’s a quick cut to the goodbye letter Catwoman left on his pillow, and then our hero steps to the edge of the building prepared to jump off...we’ve seen all this before. Before he can go fully over this time, things begin to change. This time Catwoman is there, telling him to wait. This time things are different, better—until they suddenly aren’t. 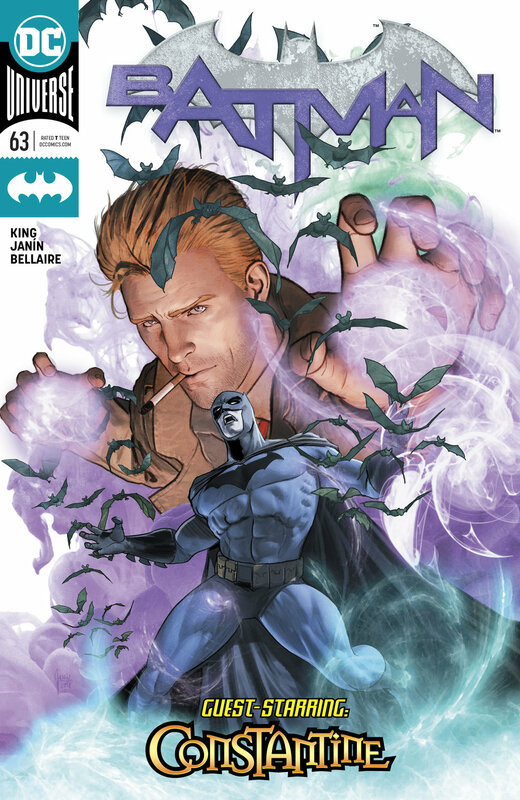 Thus is the premise of Batman #63, the third part of the ongoing Knightmares story arc for this title (and before you protest about spoilers, everything I just described happens on the first page of this very compressed issue, which is an idea we’ll return to a bit later...). Knighmares continues to be an arc of unreality. Readers don’t know what’s real and what’s not. The last issue saw Batman battling Professor Pyg, who at the very end removed his mask to reveal himself as Damian Wayne, Bruce’s estranged son and Robin. Essentially, Batman #61 planted the seeds that Batman was trapped in some sort of hallucination via the Bruce Wayne murder kid character (which I’m pretty ambivalent about, but that’s another thing all together…), Batman #62 confirmed it, and now Batman #63 builds on the concept further, doing so by replaying what so far has been the headling moment of Tom King’s Batman run—the wedding. I won’t go too far into specifics, but this issue uses John Constantine as a mechanism for both tormenting Bruce (telling him this happiness is fleeting) and giving some narrative clarity to the reader. Constantine (whose own reality we are left to wonder about for most of the proceedings) keeps telling Bruce what we pretty much know, that this is all fake and will end badly. This is all setup in the start, and I don’t want to go too far into the plot what happens. What I do want to talk about, however, is whether this issue and this larger arc is good. Let’s look at where the arc started, or, to be more precise, what it started after. In Batman #60 Alfred is assaulted in the Batcave by Thomas Wayne, Flashpoint Batman, who we knew was in this reality and assisting Bane from the last panel of Batman #50. He also gets the jump on Bruce, leaving us to wonder what happens next. What does happen next? Well, we’re plunged into the fakery of Batman #60. In some ways, this arc is one meant to stall, to keep us wondering what’s up with the Flashpoint Batman without giving us too many answers. In other ways, it’s meant to give the creators a chance to delve further into the psyche and humanity of Batman, which is what this run has been about from its very first issue. King knows that cliffhanger has fans on the hook, and now he’s basically saying let’s slow down (in entertaining and relevant ways) to look at the emotional effect on our hero. King has done this previously with other lesser-known superhero characters, mainly Mister Miracle and The Vision. Mister Miracle in particular played with perceptions of reality, with a case to be made that any action in any of was happening entirely in Scott Free’s head. Given the prominence of the character, King doesn’t seem to have (or maybe want) that same luxury with The Bat. As such, he ends up giving us more compress Knightmares (as it were) and tipping his hand sooner. Does it work? I absolutely think it does, and on the whole I enjoyed this issue and its functions within both the longer story arc and run. Basically, a little bit a clarity about what’s actually happen goes a long way, bringing what the writer is trying to do into focus and engendering us with the trust and patience we need to stick with it. This lack of clarity, in my opinion, has hurt portions of a couple of other recent Tom King comics: the ending of Mister Miracle and the beginning of Heroes in Crisis. Someone like David Lynch might get all the rope in the world to confuse the daylights out of us, but David Lynch is making arthouse cinema. In superhero comics, it’s almost always the case that writers most artful form-bending inclinations are best served by being reduced just a bit in the service of accessibility. It’s like if you were baking a cake—experiment with ingredients all you want, but you’re still going to need the sponge and taste and texture that make what you set out to do recognizable. I think Batman #63 most certainly delivers in that regard. One last note: I think Tom King’s voice and stylistic flourishes work better with some characters than with others...Constantine is without question a good fit for King, and I’m suddenly intrigued to read more of his work featuring this character, even if it’s just a cameo here or there.